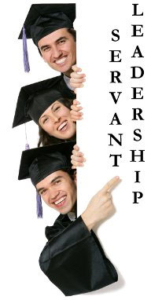 Below is a list of institutions that provide servant leadership education. These include degree, non-degree, certificate, non-certificate, online & campus only programs. The qualifications to make the list, descriptions of fields and components can be found here. If you have an institution or program to be added to this list, please review the requirements and leave a comment on this page or contact me for further information. If you have attended one or more of these programs, please help others in their discernment by leaving your feedback here as well. Thank you and keep serving. For details on the table’s attributes and requirements for making this list, please review the requirements at the link in the introductory paragraph. Our top-down pyramid style of management is a very old concept borrowed from centuries of war and monarchies.